On Labor Day, members of Bay Area Intactivists teamed up with natural birth advocates at Alta Bates Summit Medical Center in Berkeley, California as part of the Improving Birth National Rally for Change. The event aimed to empower women by educating them about evidence-based birth options that are known to reduce the incidence of complications, injury, and death. 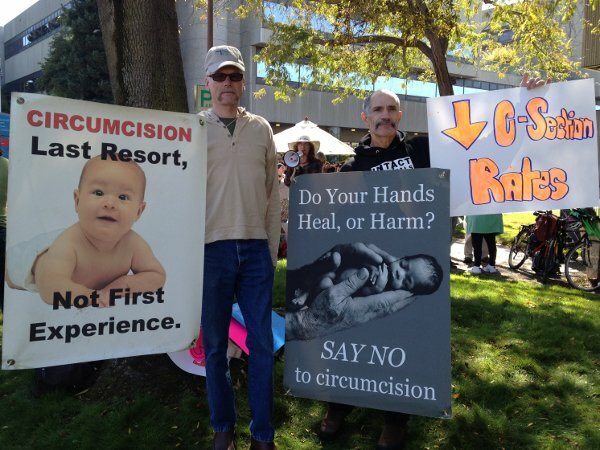 The intactivists (who wore orange placards bearing the names of children who had died as a result of circumcision complications) spent time educating those at the rally that infant circumcision, like many other routine procedures performed at birth, is unnecessary, risky, and harmful. There is news coverage of the rally available here.